A bedroom is the most intimate room in the house. It is where we sleep, we love, perchance we dream. A bedroom is the first image one sees when we awake, and last space we inhabit when we sleep. There we are vulnerable. There we are in a dwelling that wholly reflects who we are, our interests, our favorite angles, and our inspirational colors. A bedroom is an extension of a personality. Of the most famous bedrooms ever laid to canvas, Vincent van Gogh’s Bedroom in Arles comes to mind. 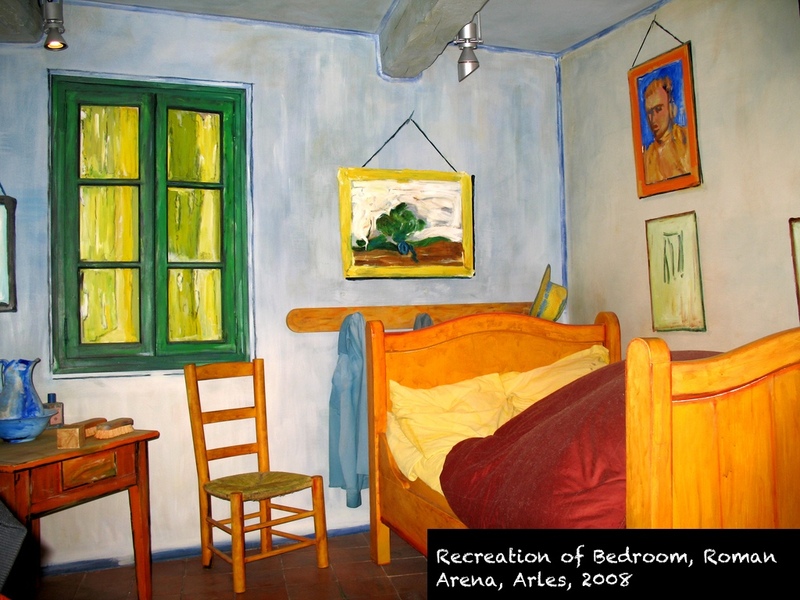 The painting depicts Van Gogh’s bedroom at 2, Place Lamartine in Arles, Bouches-du-Rhône, France, known as his Yellow House. Vincent’s Yellow House in Arles not only served as the artist’s home, but also as his studio. As a result, he hung many of his newly painted works on the walls within the Yellow House. In the depiction I am using, the paintings on the right wall are identified as miniatures of Van Gogh’s portraits of his friends Eugène Boch (entitled The Poet) and Paul-Eugène Milliet (entitled The Lover). 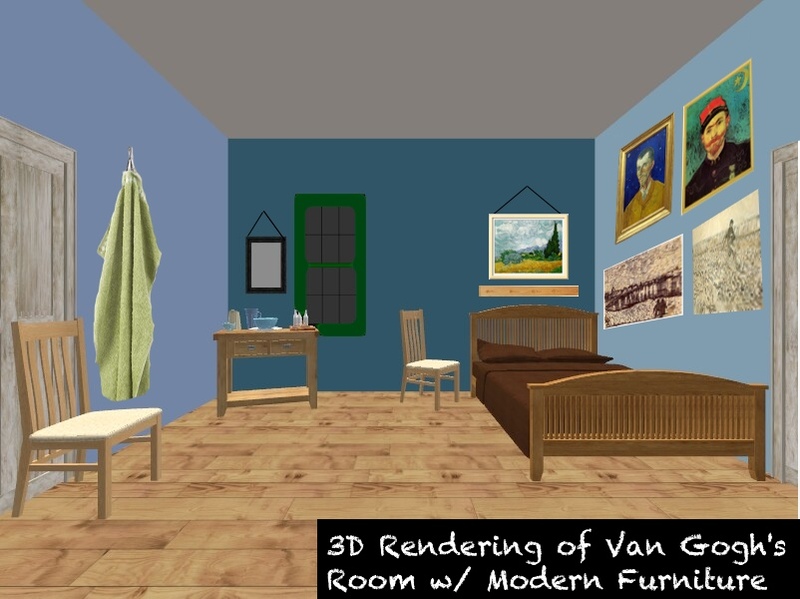 Van Gogh created and recreated this bedroom in painstakingly accurate detail, rendering, and recreating the image on canvas and paper, not once but three times. He even resketched the room in letters to his younger brother Theo van Gogh, and to his volatile, fair-weather friend, Paul Gauguin. This brings the total repetition by Van Gogh to five total images. This time it simply reproduces my bedroom; but colour must be abundant in this part, its simplification adding a rank of grandee to the style applied to the objects, getting to suggest a certain rest or dream. Well, I have thought that on watching the composition we stop thinking and imagining. I have painted the walls pale violet. The ground with checked material. The wooden bed and the chairs, yellow like fresh butter; the sheet and the pillows, lemon light green. The bedspread, scarlet coloured. The window, green. The washbasin, orangey; the tank, blue. The doors, lilac. And, that is all. There is not anything else in this room with closed shutters. The square pieces of furniture must express unswerving rest; also the portraits on the wall, the mirror, the bottle, and some costumes. The white colour has not been applied to the picture, so its frame will be white, aimed to get me even with the compulsory rest recommended for me. I have depicted no type of shade or shadow; I have only applied simple plain colours, like those in crêpes. It seems the artist is obsessed with color, not so much items. He describes his chosen bed, the repainting of his chairs, the reason his sheets are red. He is intrigued by the contrast and meaning of colors. Art historians even agree that his work from his Arles period was richly, and thickly applied in yellows, ultramarines, and mauves. 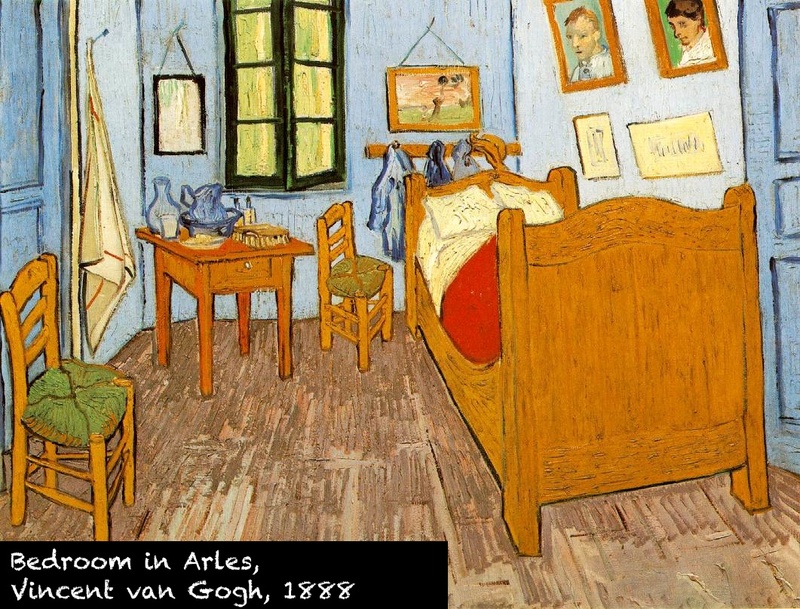 The room depicted is the space Van Gogh inhabited immediately following his nervous breakdown and stint in a Hospital in Arles. During this time Van Gogh famously cut off his ear and even suffered hallucinations and delusions. He oscillated between his bedroom and the hospital – not knowing what was real and afflicted by mental fragility and the belief that he was constantly being poisoned. A bedroom is meant to be comfortable and upon first glance the Bedroom in Arles (First Version) looks cheery. The main colors are light and almost pastel in nature – draped in robin’s egg blues, sunny yellows, and sable. The simple interior, sans shadows (and looking quite like a Japanese Woodblock) features bright , sunny colors which represent the notions of “rest”, “positivity” and “sleep”. Yellow was Van Gogh’s favourite color throughout his Arles and Saint-Rémy period–whether outdoors in wheatfields under the Provencal sun or indoor works such as the bedroom. The upward slope of the perspective even seems hopeful. However, during this time he was deeply troubled. Perhaps he saw his room as his only respite, a space filled with optimism and the promise of tomorrow. However, in the painting the objects seem to tilt upward because the artist has not applied the laws of perspective accurately. Van Gogh worked this way on purpose as noted in his letter. Therefore, in my 3D rendering to come, the laws of perspective will also all be slightly skewed. Below enjoy my “Real Life Options” take on recreating van Gogh’s space. The room is quite simple at heart, and has a few decorate touches. More than anything, the proper wood flooring and the right Cerulean, Prussian, and Cyan blue paint tones will make this space. Viva his Lust for Life, and live in his room, but perhaps not his mindset, below!